apologies for the lack of posting last week. having a cold in june is no fun at all! at least in the winter you can bundle up in a cozy blanket on the couch with a cup of hot tea and watch holiday movies - but in the summer, it's warm and uncomfortable inside, tortuously sunny outside and there's nothing on tv worth watching but old reruns of top chef and real housewives of where ever. but we are feeling better and ready to cook! this tart is a random creation born out of buying too many beautiful red grapes. the flavors are mostly savory with a hint of sweetness from the roasted grapes and a little wintry with the addition of thyme. perfect for lunch with an arugula salad and a glass of viognier! preheat oven to 375 degrees F. in a food processor, pulse flour, cornmeal and salt to combine. add butter and pulse until mixture resembles a coarse meal. add ice water while pulsing, just until dough comes together. press evenly into a 10 1/2 x 7-inch rectangular tart pan with removable bottom. chill 20-30 minutes or until firm. blind bake using foil and pie weights or rice for 12 minutes. remove foil and bake for 5-8 more minutes. combine grapes, shallots and 5-6 sprigs of thyme on a sheet pan and toss with olive oil, salt and pepper. roast at 375 degrees F for 15 minutes or until grapes are shiny but not wilted. remove thyme and set aside. in a small bowl, combine goat cheese, ricotta, egg, lemon zest, salt and pepper. 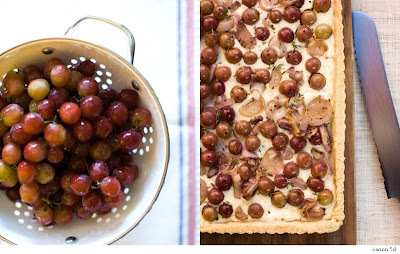 spread evenly in baked tart shell and top with roasted grapes and shallots. bake 20-25 minutes or until filling is set and crust is lightly browned. garnish with a little fresh chopped thyme and fresh cracked black pepper. enjoy! Your blog is lovely, what an amazing recipe!! A food stylist and photographer what a perfect blogging pair!! The photographs are so so lovely! Roasted grapes...yum! YUM!!! I love goat cheese with just about anything! Ive never tried with roasted grapes! Sounds and looks amazing! Great blog! I love the combinations of flavors you use. This tart looks delicious! I LOVE roasted grapes. I toss them with bitter greens and blue cheese for a quick, but filling, salad; alongside duck confit; or, with the addition of little honey, atop my morning bowl of porridge. I can't wait to try this tart - what a great idea! Happy that you're feeling better. This recipe looks tremendous. I have the perfect Viognier in mind for the pairing ;) .